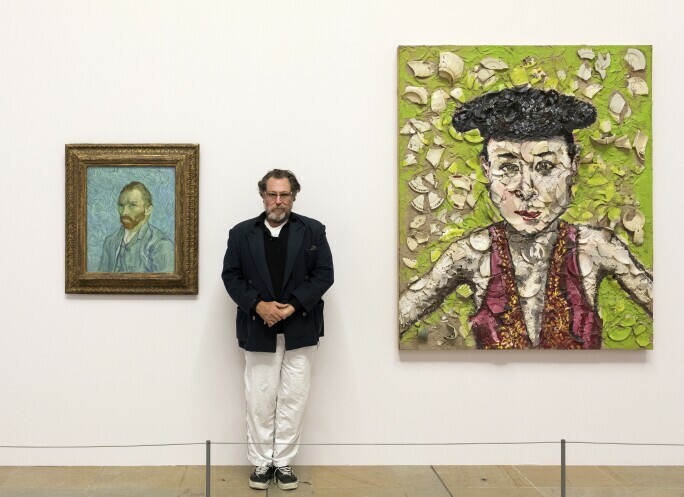 Julian Schnabel in Orsay through the Eyes of Julian Schnabel at the Musée d'Orsay, 2018. Photo: Sophie Crepy Boegly. Image courtesy of the Musée d'Orsay. 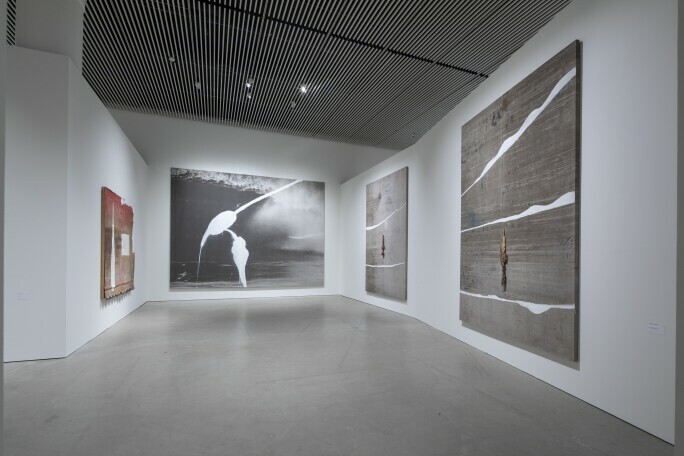 American artist Julian Schnabel is no stranger to achieving global renown, having had his first stint of success in the 1980s alongside fellow artist and close friend Jean-Michel Basquiat. Despite Basquiat's untimely death, Schnabel has endured as a prominent figure in the art world. He's able to wear many hats as an artist, and today, Schnabel shines as both a filmmaker and a painter. Schnabel has once again been thrust into the spotlight for these diverse art-making practices. On November 16th, he will release his new film, a biopic entitled At Eternity's Gate. The film takes a close look at the final days of Vincent van Gogh (played by the similarly multi-talented actor Willem Dafoe). 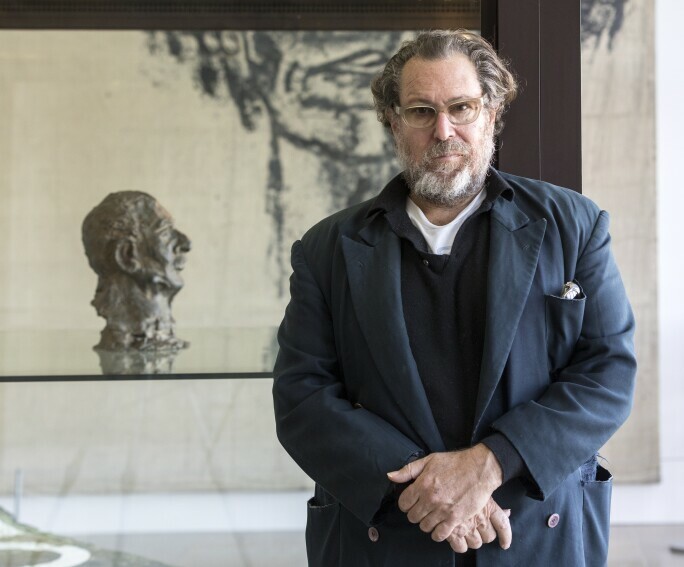 Schnabel is also the focus of two major exhibitions in Europe this season: Orsay through the Eyes of Julian Schnabel at the Musée d'Orsay in Paris and Julian Schnabel: Aktion Paintings 1985-2017 at the ARoS Aarhus Kunstmuseum in Denmark. At the Orsay, Schnabel's been granted carte blanche; he's selecting from the museum's vast permanent collection to present across two of the museum's historic rooms a new scenography and selection of works that have never been shown together. Julian Schnabel in Orsay through the Eyes of Julian Schnabel at the Musée d'Orsay, 2018. Photo: Sophie Crepy Boegly. Works Pictured: Julian Schnabel, Tina in a Matador Hat, 1987; Vincent van Gogh, Self-Portrait, 1889. Image courtesy of the Musée d'Orsay. Schnabel’s success has always been accompanied by public interest in his personal life and his flamboyant, profligate lifestyle. His rise to fame in the 1980s brought him wealth and a cluster of highly publicized friendships with famous figures, including Andy Warhol, David Bowie, and Bono. This meteoric fame, and Schnabel's willingness to remain prominently in the public eye as a celebrity since, have generated much controversy. All the while, Schnabel has continued to produce art, radically developing his style and exploring new mediums along the way. For example, he has developed a highly acclaimed filmography, released an album, and even worked designed a Manhattan palazzo. Here, we take a closer look at some of the artist's phases throughout his career. 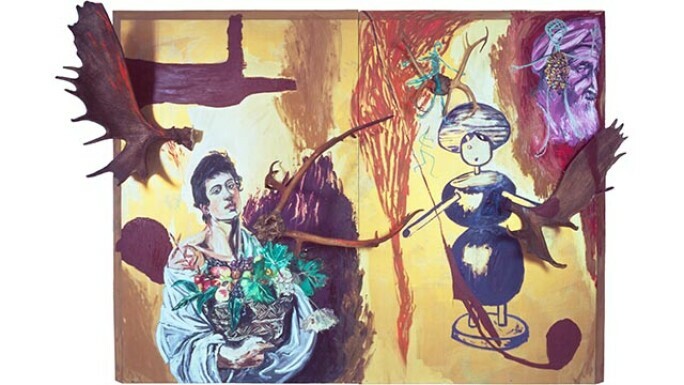 Julian Schnabel, Tina in a Matador Hat, 1987. Photo: Bichofberger Collection, Männedorf-Zurich, Switzerland © ADAGP, Paris 2018. Image courtesy of the Musée d'Orsay. The 1980s are often crudely summarized as being years of excess - a philosophy arguably summarized by Gordon Gekko in the 1987 movie Wall Street, who uttered the infamous and ruthless mantra ‘Greed is good’. It was the decade of Reagan and Thatcher, substantial economic growth, huge social and political tension, major technological change, lingering vestiges of the Cold War, the AIDS crisis, and vast increases in global wealth inequality. In the midst of this turbulence, art also experienced radical experimentation, and the Neo-Expressionist movement of American contemporary art was born. Julian Schnabel, The Exile, 1980. Mixed media on wood, antlers. Photo: Galerie Bruno Bichofberger, Männerdorf-Zurich, Switzerland © ADAGP, Paris 2018. Image courtesy of the Musée d'Orsay. In music, electronic instruments like synthesizers changed everything, helping to bring artists like Michael Jackson and Prince to prominence while bewildering older pop titans like the Rolling Stones and Bob Dylan. In literature, the complexity of Postmodernism grappled with the simplicity of Minimalism. In the visual arts, Neo-Expressionism, and Julian Schnabel, arrived. This movement was considered to be a reaction against the minimalist and conceptual art that dominated during the 1970s. The Neo-Expressionist style was rough, aggressive, often used bright colors and embraced figurative works once again. In Europe, painters like Georg Baselitz and Anselm Kiefer championed the style, while in America, Schnabel, Basquiat and Philip Guston practised their own spit on the methods. Schnabel's plate paintings from the period remain some of his most famous works. 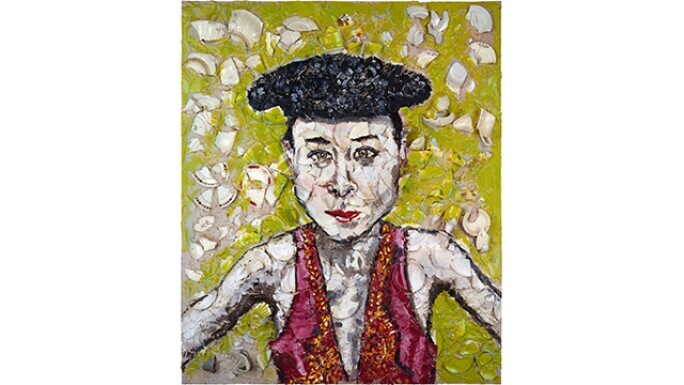 They are composed of painted shards of broken plates and the subjects were often portraits of figures. Since the plate paintings, Schnabel has continued to experiment with painting, producing vast compositions with styles that move beyond the Neo-Expressionism that he became known for in the 1980s. 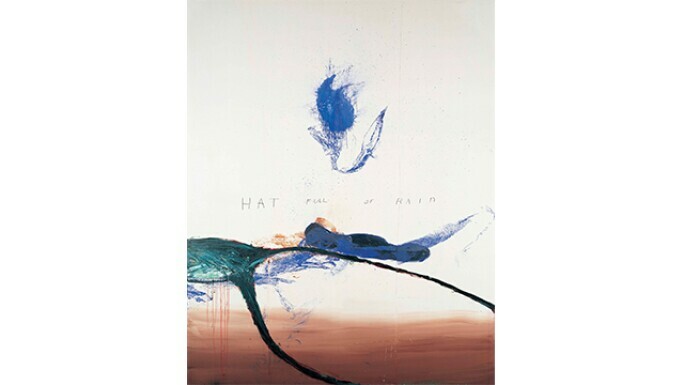 Julian Schnabel, Hat Full of Rain, 1996. Photo from Julian Schnabel Archive 1996. Image courtesy of the ARoS Aarhus Kunstmuseum. Schnabel's experimentation with painting continued into the 1990s. 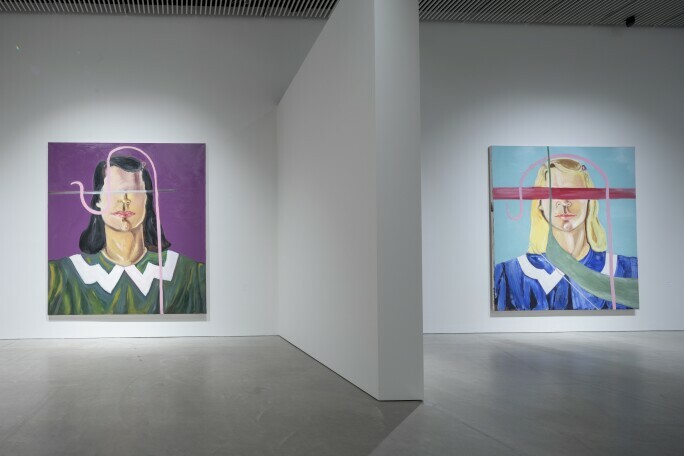 One can easily get a sense of the full range of Schnabel's painting at Denmark's ARoS Aarhus Kunstmuseum, where the current survey of Schnabel's work from 1985-2017 is on display. Julian Schnabel: Aktion Paintings 1985-2017 includes abstract and figurative works, most of which are monumental in size. Interestingly, the show is partly curated by Schnabel, who has organised it not chronologically but according to thematic and stylistic concerns. Installation view of Julian Schnabel: Aktion Paintings 1985-2017. Photo by Anders Sune Berg. Image courtesy of the ARoS Aarhus Kunstmuseum. In many of the works on view, Schnabel introduces a mark or line that disrupts the integrity of an underlying image. Some of the most striking instances can be seen in the Big Girl Paintings series - large square paintings of women that form one of the exhibition's other thematic groupings. The underlying depictions of women are fairly simple, centered on the head-and-shoulders area, often over a monotone background. These traditional portraits are then split apart by a handful of marks or dividing brushstrokes that segment the canvases. Several also include a mark blocking - or blindfolding as it were - the eyes of the subject. As a consequence, the portraits - already violated by the lines across the canvas - are disturbed even further; the viewer cannot identify or easily connect to the women in the paintings. Instead, they become deeply enigmatic and conflicted. This disruption of painting's norms extends from the fractured surfaces of his 1980's plate paintings through Aktion paintings up to recent works today. Photo of Palazzo Chupi, 2013. Image by Elisa Rolle. Schnabel has also applied his extravagant artistic style and monumental ambitions to architecture. 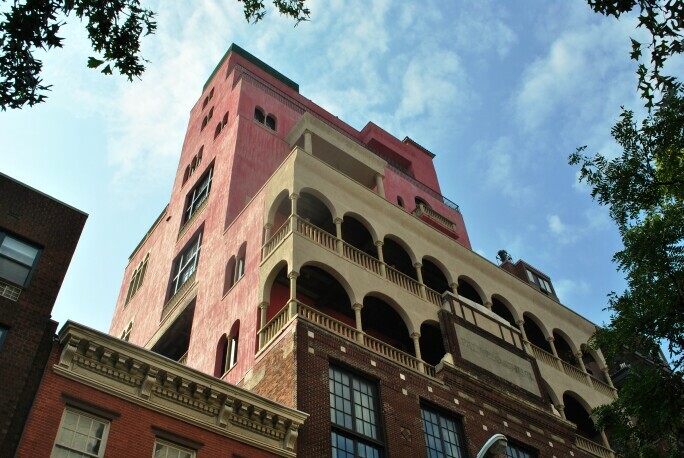 In 2008, he completed the conversion of his West Village townhouse into ‘Palazzo Chupi.’ The 'Palazzo' consists of five vast units above the original townhouse, all of which are painted in a bright pink. The Palazzo is therefore starkly different from any building nearby; it's generated much discussion and has stood in stark contrast to architectural conventions and historic precedent. One of the most well-known dissenters is Andrew Berman, Executive Director of the Greenwich Village Society for Historic Preservation, who has passed succinct and scathing judgment on the building, calling it "woefully out of context and a monument to this guy's ego." Despite the opposition, the building still stands, some of the palatial units are owned by celebrity friends of Schnabel's. Still from Basquiat (Julian Schnabel, 1996), featuring David Bowie as Andy Warhol and Jeffrey Wright as Jean-Michel Basquiat. Courtesy of Swank Motion Pictures, Inc. and Build A Fort Productions. In the 1990s, Schnabel began to direct full-length feature films. His first offered a fictionalized portrayal of the brief life of Jean-Michel Basquiat, Schnabel's friend and fellow world-famous Neo-Expressionist. The film incorporated performances from several of Schnabel's friends, including David Bowie, who played Andy Warhol. The film was a critical and commercial success. Since its release, Schnabel has directed five additional feature-length films including, most notably, The Diving Bell and the Butterfly (2007), a highly acclaimed adaption of Jean-Dominique Bauby's memoir of the same name, which chronicled his life in the aftermath of a major stroke resulting in locked-in syndrome. The film was widely rated one of the best films of the year and went on to receive acclaim from the BBC in 2016 as one of the best films of the century. Still from At Eternity's Gate (Julian Schnabel, 2018). Image courtesy of CBS Films. 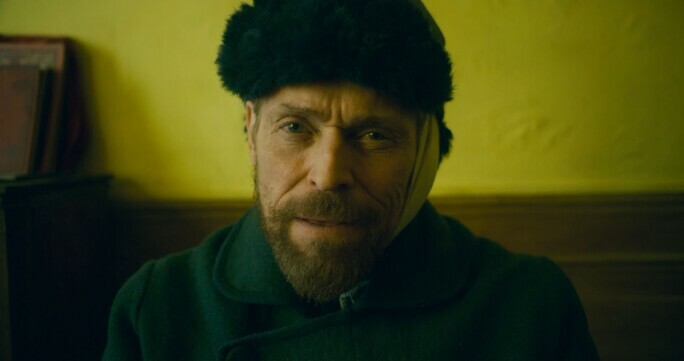 The imminent release of At Eternity's Gate, Schnabel's biopic of van Gogh's final days, returns the artist to a thematic level he knows well - the artist biopic. Both Basquiat and At Eternity's Gate depict the lives of troubled artists whose lives ended abruptly and prematurely. The films demonstrate Schnabel's passion for the medium of painting as well as the grand artistic ambition of eternal radical innovation. The film, concurrent with his Musee d’Orsay exhibition, demonstrate Schnabel's continued relevance within the art world and the broad range of his artistic practice.